The mini recorder that fits in your pocket, UltraStudio Mini Recorder is super tiny and includes just SDI and HDMI connections, plus Thunderbolt. Simply plug in and record from any SDI and HDMI device for the most incredible portable solution. 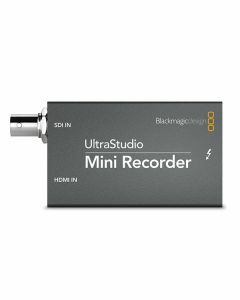 The Blackmagic Design UltraStudio Mini Recorder Capture Device is a mini recorder that fits in your pocket by refining its design down to SDI and HDMI connections, plus Thunderbolt. It is, essentially, the "capture" aspect of any Blackmagic capture and playback device. The intended purpose of the Blackmagic Design UltraStudio only capturing, as opposed to unloading a camera's memory card onto a computer, is to transfer the highest quality footage possible. A capture and playback device performs this function in one of two ways. Firstly, by capturing live from a camera as it records. In this case footage is recorded directly from the camera's sensor, bypassing compression and as a result transferring pure uncompressed footage. Alternatively, video can be captured from a camera's play back footage that had already been recorded and stored. In this second option the footage is compressed as it is recorded. This can be attributed to inadequate hardware since a memory card has nowhere near the storage space necessary to hold uncompressed video. Blackmagic's Media Express software, which is free to use to accept and encode incoming footage, is included as a free download with purchase. The Blackmagic Design UltraStudio Mini Recorder connects to camera by HDMI or SDI and outputs to a computer by Thunderbolt. SDI Video Input: 1 x 10 bit SD/HD switchable. SDI Audio Input: 8 Channels embedded in SD and HD. HDMI Audio Input: 8 Channels embedded in SD and HD. Software Included: Media Express, Disk Speed Test, Blackmagic System Preferences and Blackmagic driver, Mac OS X and Windows Drivers. Internal Software Upgrade: Firmware built into software driver. Software driver loads upgrades at system start or via updater software. Other supported applications include: Nuke, Avid Symphony, Avid News Cutter, Tools On Air just:in & live:cut & just:play & just:live, Softron OnTheAir, MovieRecorder and OnTheAir CG, Flash Media Encoder, Wirecast, Livestream Procaster, Resolume Avenue 4, Sony Vegas Pro, Corel VideoStudio Pro X4, CyberLink Power Director, MAGIX Video Pro X4, Vidcaster Pro & Studio & Broadcast, Uniplay, Playbox AirBox, CasparCG, Magicsoft CG, Xsplit Broadcaster, Imagine Communications Velocity & InfoCaster. SD Format Support: 625/25 PAL, 525/29.97 NTSC. HD Format Support: 720p50, 720p59.94, 720p60, 1080PsF23.98, 1080p23.98, 1080PsF24, 1080p24, 1080PsF25, 1080p25, 1080PsF29.97, 1080p29.97, 1080PsF30, 1080p30, 1080i50, 1080i59.94 and 1080i60. SDI Compliance: SMPTE 259M and 292M. SDI Metadata Support: VITC read for 3:2 pulldown removal. VANC capture using up to 3 lines of video in file. HD RP188. Closed captioning. Audio Sampling: Television rate of 48kHz and 24 bit. HDMI Resolution: Pixel for pixel HD resolution input to connected device. Multiple Rate support: SDI and HDMI are switchable between standard definition and high definition. Colorspace Conversion: Hardware based real time. HD Up Conversion: Software based up conversion during video capture. Physical Installation: Requires computer with a Thunderbolt port. Please check the Support pages to see the full system requirements.